Vehicle wraps – modern, striking, and transformative for your personal or commercial vehicle. Offering the ultimate in customization for your vehicle, the Wraps1 team in Miami can take any vehicle and wrap it in a million different ways whether you’re driving a commercial food truck, the humble family sedan, or something loud, fast, and mean. You’ll see our wraps all over the United States, and we’ve helped create some truly spectacular custom vehicle wraps, as well as innovative retail graphics and commercial truck wraps. That old, peeling decal you’ve had on your commercial vehicle isn’t doing your company any favors when someone sees your trucks making a delivery. When you work with us to design a unique commercial van wrap, you’ll be creating a vivid, rolling advertisement for your company. With our commercial box truck wraps, we’ll boost your business’s reputation and appeal with our personalized and custom approach. Want to be the vendor with the huge lines at lunch? We’ll design a custom food truck wrap that will help your personal brand grow, as well as serve as an announcement to everyone that the city’s best food has arrived. Are you working with cross-country hauling? We also design seamless semi truck trailer wraps that make your fleet look sleek and professional. If you’re looking for something temporary for your convention, festival, or road trip, we’ve got you covered with our on-demand vinyl wraps. Is your band on a cross-country tour? We’ve got a bus wrap for that. Are you on a speaking tour across the United States? We’ll help you let everyone know with a custom Bus/RV wrap. You’ve seen the attention a car gets when it’s got a custom vehicle wrap design, and we can help your vehicle reflect your individual personality, too. Maybe you’ve got something outrageous in mind for your GTR, or perhaps you’re after something a little more subtle for your M5. Our custom sports car wraps are as extreme or minimalistic as you want. Our design expertise, wrap technology, and certified installers allow us to comfortably and professionally handle any vehicle shape and size. Whether it’s a motorcycle, a brand new pickup, or Mclaren, we will wrap your baby in style. Enjoy your Sunday cruise even more with a motorcycle wrap that sets your ride apart from the pack. Have your own wrap design in mind? Well let’s bring it to life! Seriously this industry is our blood and we take absolute pride in the cars we wrap and the people we work with. Do you love Miami from the water? Well check out one of our smooth Florida boat wraps for your watercraft. Got a crazy yacht with a helipad? Let’s get her wrapped up. You can even wrap interior elements of a boat or yacht. Rather than redo the cabinets, let’s wrap then with a wood grain wrap. There are several styles to choose from. Maybe you’ve been cruising around in the same speedboat for a decade, and your contemplating a paint job. Explore wrapping your boat, and having us do it. Vinyl wraps are cost effective, offer complete protection, and can be removed years later when your ready for a change.Whatever you pilot, we’ll help make you look good out on the water. We have wrapped hundreds of boats, and boats of all style. The vinyl wrap industry is truly transforming the way you are able to customize and protect not only your vehicle, but your marine vessels. 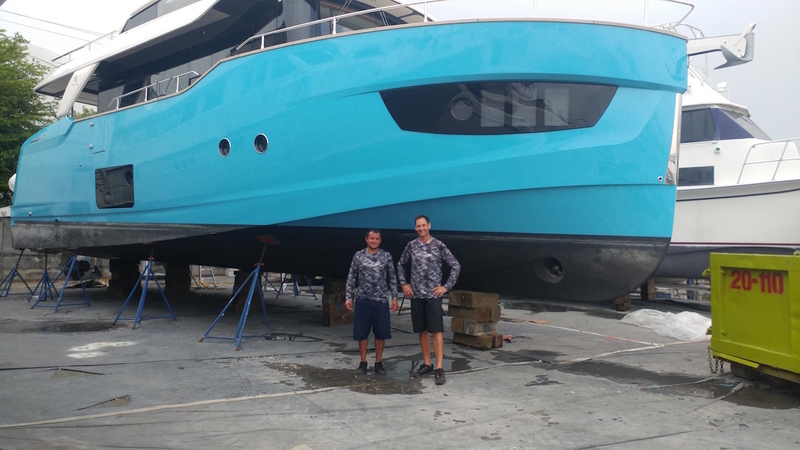 Vehicle Wraps 1 is a superior provider of boat wraps in Miami, boat wraps in Fort Lauderdale, as well as in the Florida Keys. We service all of South Florida and will travel north to Orlando or Tampa by appointment. We have created an entire division of Vehicle Wraps 1 that specifically caters to our Florida boat wrap clientele. Give us a call, or feel free to check out our boat wrap division, Marine Wraps 1 – www.boatwraps-florida.com. Ask for Burl, he will take care of you! For all your Miami car wraps and other retail graphic design needs, contact Wraps1 today at (13059163410. Do you have one of the teenagers who works for you handle the graphics for your store each time there’s a sale you want to promote? Next time you want passersby to notice your store, try one of our custom window graphics. Want to reuse those decals for annual sales? We’ll help you design vinyl wall decals, as well as signs and banners for your company’s events. In addition to storefront graphics for businesses, we can also dress up your community event or family announcement. Tell everyone about your parents’ 50th wedding anniversary with one of our large banners or show everyone where the celebration is for your holiday bash. So, you want to know more about vehicle wraps and what to expect during the process. Our vehicle wraps can take your dream car and make it unique even if it’s already a spectacular machine like a Lambo or a Porsche. During the vehicle wrap installation process, we’ll treat your car like it was a member of the family whether it’s the latest model or your cherished classic. And we also offer almost any color and finish you can imagine from brush metallic to pearlescent. Sure, flat black wraps are all the rage, but our custom vehicle wrap design can accommodate so much more. Your vehicle wrap cost will depend on the materials used, as well as the intensity of the graphic design process. We might have to remove certain body parts from the vehicle to complete the installation, and this is why we keep auto body professionals on staff. Do you know exactly what you want on your commercial van wrap? Perhaps you’re just starting to look at designs for a sports car wrap. We’ve got the tools and experience to help you design something amazing. Trust Wraps1 in Miami for your flawless vehicle wrap. From our Miami Car Wrapping facility, we provide custom vehicle wraps in Hialeah, Miami Gardens, Hollywood, Fort Lauderdale and many other Southern Florida areas.